The small village of Duror is set in the heart of very beautiful scenery, combining the delights of hills, lochs and seashore. 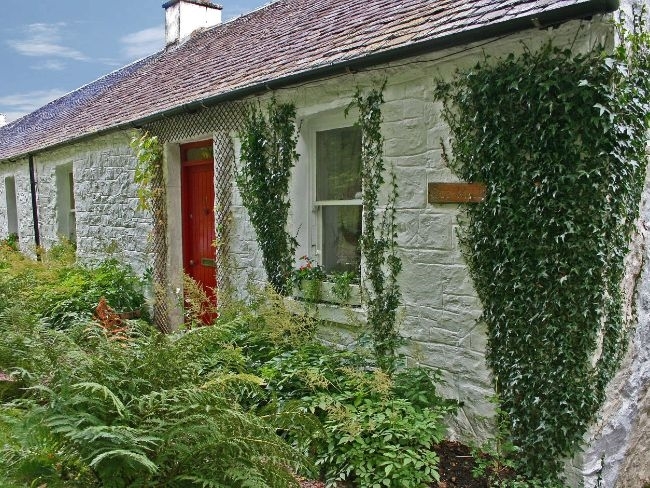 This charming stone-built, semi-detached cottage stands beside the road with a large, very pretty enclosed secluded garden to the rear with views to the mountains. A wide range of local activities includes fishing, golf, sailing, canoeing, horse riding, mountaineering, mountain biking and walking. Take your bikes across on the ferry from Port Appin to explore the Isle of Lismore. There is easy access to Glencoe, Fort William, Oban and day trips to the islands. There are several good restaurants in the area. The accommodation offers THREE bedrooms: 1 king-size and 1 double. 1 triple room with a double and single bed located in the loft conversion accessed via steep steps. (Suitable for children over 5 and fit adults) Bathroom: with shower over bath. Lounge: with open fire, Sky TV, DVD, CD player and telephone for incoming calls only. Kitchen/diner: with wood-burning stove, fridge/freezer, washing machine and tumble dryer. Outside: enclosed secluded garden to the rear with views to the mountains. Garden furniture is provided for outdoor living in peaceful, tranquil surroundings and there is a pond (care required with young children.) Amenities: parking for 2 cars. Bed linen, towels, electric and solid fuel included. 1 dog welcome (Pets must be kept under control as there is livestock in adjacent field.) Regret no smoking. Please note the village shop is no longer open. Wi-fi available. Shop: 8 miles. Arrival: 4pm.